There’s lots of great reasons to start to bike places you would normally drive. There’s enjoyment, exercise, environment, cost, oil dependence and many others. I have to say that there are a few on that last that are appealing to me. But none are my primary motivation for forgoing the comfort of the auto and suiting up for a cold ride. My main reason for going by bike most places is minimalism. Minimalism as a lifestyle is about escaping excess, getting rid of glut, cutting debt, breaking away from ennui. Biking is one of my choices that fits into that motif. To me the bike represents minimalism compared to cars in several ways. The bike is a much simpler machine compared to a car, it’s much smaller, much more power efficient. It’s the most fundamental form of transportation next to walking. It’s a form mostly stripped of excess. 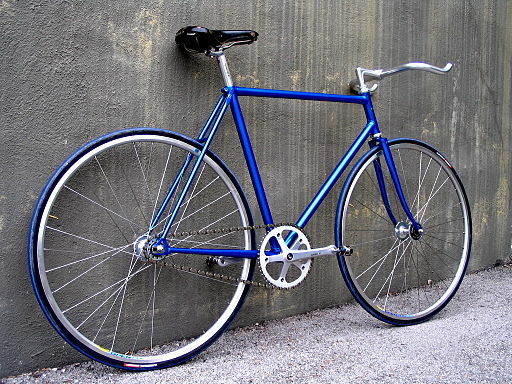 The bicycle has minimal maintenance costs. They are so simple even a Software Developer can like me can perform most maintenance. I have a few specialized tools around that are used to take care of my bike, but most things can be done with standard wrenches and screwdrivers. I could never say that about my car. With so many systems and so much weight I feel it is better to leave all that to professionals. space for my bike normally and I can always squeeze to the front of the line and turn right on red no matter how many cars are waiting to go straight. Minimalism has its advantages. Biking expends minimal energy. Think about what the majority of energy is being used for when you transport a 200 lbs person in a 2300 lbs compact car. Now factor into that the engine can only deliver 1/5 of the gasoline energy into kinetic energy. There is a massive amount of energy investment when moving by car. And most of that energy is wasted as heat, exhaust, and just plain moving ballast around. The bike suffers only minimally from these losses. The bike weight is only around 1/10th the rider weight, the heat losses are only the riders body heat. Although you could argue that the benefit is fitness and this is not really a loss at all. Any exhaust produced is purely coincidental and not related to the production of forward motion. Simplification is beautiful. Simplification is what you get when you forgo the automobile for a seemingly less convenient bike. No expensive professional maintenance, no extra tonnage, never pay for parking, and while everyone is going insane about the price of gas, I can shrug and say c’est la vie. Rob perhaps this is why we’re friends, we share the value of living light. It’s one of the reasons I love running to work .. there’s something innately powerful about commuting the way we’re done for thousands upon thousands of years ever since we branched off the Neanderthals. Hey, great post! I’m studying the motivations and barriers for biking for a phd at the university of Copenhagen. I also have a blog called On Our Own Two Wheels about the experience of riding bicycles in cities around the world. I cross posted some of your thoughts over there. Thanks for the piece! No sweat Ezra. I found your pingback almost immediately. You’ve got a very cool blog too. This is one reason I look forward to moving. Nearly everything I have I will end up dumping. I’ll either sell it or donate it. As long as I have my computer, clothes, books and DVD’s I’m happy. I tend to collect too much crap. For the most part, the European nations that are the happiest live a minimalist life (along with riding a bike of course). I read last year on a blog talking about how difficult it is to live a minimalist lifestyle in North America, because people actually expect you to purchase the latest and greatest all the time and have the biggest (whatever) there is. I’m personally car-lite, and will probably never be car-free, but there’s a huge difference in financial outlay when I drive vs. when I bike. For instance, my next scheduled car maintenance is supposed to be sometime in November, but I am still about 3000 km from reaching the mileage on the sticker. It’s very satisfying when I can find a way to do without. Graham and I definitely have that in common. Ryan, I suspect that the less consumptive lifestyle of Europe is partly due to the expense of everything there. At least the parts I’ve been to. When I lived in Denmark, owning two cars was almost unheard of. My family in Waterloo had 3 or 4 at that time. Octavian, I can’t remember the last time I put gas in my family vehicle. I know it’s being driven, but due to the fact that I’m never in it, I don’t pump. Life is good when it’s minimized.